The Hahnville boys soccer team opened up district play with a big 6-2 win over Higgins. The Tigers started the game fast with early scoring opportunities due to two great passes from junior Craig Ford to senior Julius Medina only for the goal keeper to make saves on the first two runs. However, the third time proved to be a charm. Ford found Medina and Medina took a shot that glanced off the goal keeper. Tiger junior Kevin Falgout chipped it in for the goal. Falgout got another goal after a poor clear by a Higgins defender to put the Tigers up 2-0. Finally, Medina would get his goal after a steal by Ford, who worked the ball to the right corner and found Medina to put the Tigers up 3-0. Hahnville took a 3-1 lead into the half and came out in the second with the same intensity. Ford found senior Mitch Eilers in the goal box for a score to put the Tigers up 4-1. Then, sophomore Coby Orgeron made a great play at midfield to work the ball up the field and find Ford. Ford took the shot and found the back of the net to put Hahnville up 5-1. Higgins again put together a set of passes to work the ball deep into the Tigers side of the field to get a shot off for their second goal, but Hahnville countered with a goal by Julian Turner for the 6-2 win. After the victory, Hahnville returned to district play and picked up a 2-1 win over Bonnabel. Hahnville was impressive from the start, winning the 50/50 balls and outhustling the Bruins. This intensity paid off with an early goal by Medina as he made a move on Bonnabel’s right back then used his speed to beat the goalie for an angled shot and score. The Bruin’s answered with a long ball over the Tigers defense that was caught by their speedy forward who scored to tie the game at 1-1. Both teams had plenty of scoring opportunities for the rest of the half, but both goal keepers came up big to keep the score at 1-1. Hahnville finally took the lead after a cleared ball by senior defender Adrienne Edwards. 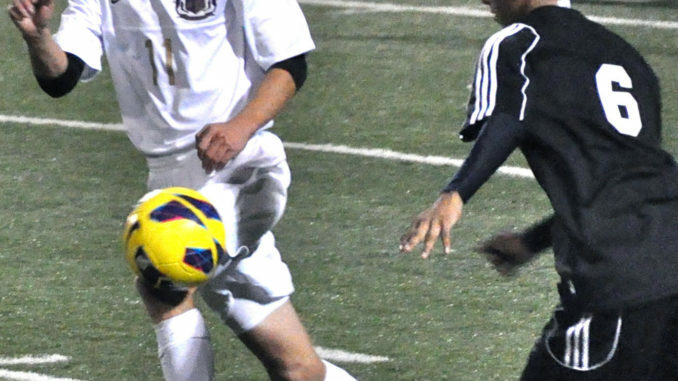 Brennen Samaha took control of the ball at midfield and found senior right midfielder B.J. Hartman. Hartman worked the ball into the corner and crossed it to Dakota Evans. Evans shot and scored to give Hahnville a 2-1 advantage at the break. The Tigers were unable to add to their lead in the second half, but a stifling defense gave Hahnville the win.